Hello to all you knitters, spinners, bloggers and other interested parties. Carole’s husband Dale here. I get to be her guest blogger today because it’s her birthday and she should get the day off. 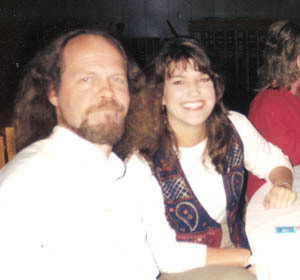 Carole and I, September 1996. We were both thinner. 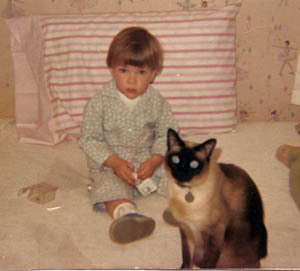 And we both had more hair. Ahem. This is the 10th time that I’ve gotten to celebrate this day with Carole. That’s right. A decade of birthdays. I will not post her age (a guy can get in trouble for things like that) but I will remind you that last year she celebrated the big four-oh. You can probably figure out her age on your own, you’re a pretty smart bunch, I hear. Carole and I both believe that birthdays are a great time to celebrate with a night out, or a party, or even a weekend get-away. We’ve even been known to do all three of those things for just one birthday. And honestly, some of our nicest mini-vacations have been when we’ve gone away to celebrate a birthday. For instance, we met Norma on Carole’s birthday get-away last year when we went to Vermont. And I’m sure Carole will be blogging about this year’s birthday trip. I hear she’s even planning a photo shoot with her new Moth shawl. What I really want to do is reflect on birthdays in general and Carole’s in particular. I think a birthday should be a time to look back over the past year. Truly, it’s what you’ve done with those 365 days that’s important and a birthday celebration should be two-fold. It should celebrate what you’ve done, who you’ve spent your time with, and where you’ve gone during the past year. And it should also be a time to look forward to the beginning of a new year in your life. A time to anticipate what you’ll do, who you’ll do it with, and where you’ll go. It’s kind of like your own personal Happy New Year! I know that this last year Carole has had a ball and a very big part of that is because of all of you out there that are reading this. It has been a fabulous year for friends, new and old, and trips and fiber and spinning wheels and so on and so on. You’ve all been there for my Carole. You’ve cheered her on, you’ve offered advice, you’ve consoled her and supported her and you’ve been her friends. No one knows what next year will bring. But I do know, for Carole, that it will include all of you. Thanks for tuning in and wishing Carole a happy birthday. Oh, and one last thing. Carole? You’re just as cute now as you were when this picture was taken almost 41 years ago. I love ya! Happy Birthday!!! Hope you get plenty of time to do what you want. I think you got the last great man in the world! I don’t know if my husband would’ve done such a wonderful post for me. may your birthday be wildy fun Carole! Thanks to Dale for guestblogging too! he’s so good that guy! Happy Birthday to you! Aren’t you the lucky girl who gets to spend a special birthday with such a great guest blogger – your special guy! Way to go Dale! OH MY GOD IS THAT GIRL CUTE! Happy birthday birthday girl! And Dale–well, all I can say is you two are a lucky couple. A very very happy birthday Carole! Happy birthday Carole! Hope you have a fabulous day! I want to wrap Dale up and stick him in my pocket. Bravo! Carole, Happy Birthday my darling…you are the greatest and I’m so glad to know you! Happy Birthday,Carole! Dale didn’t mention how many k2tog’s were in that birthday equation. Oh, and Hank, let me just say…hubba hubba. Holy Smokes!! Scrolling down to say Happy Birthday!! Man, is it Saturday yet? Happy Birthday! I’m all choked up. You were indeed a beautiful child, and you are a beautiful woman now. Thanks for sharing your like with us. What a great post Dale, you make a fine guest blogger. Happy Birthday Carole, may your birthday’s get better as each year passes. Sweet post! Sweet hubby! Carole I hope your birthday was the bomb bay-bee (past tense since I’m late in reading bloglines today)!!! And I hope you guys have many more birthdays to celebrate together! Wishing you a very Happy Birthday Carole! Happy happy day, Carole! You and that Dale, you’re some wonderful couple. Enjoy!! Oh oh oh! I missed it! I’m so sorry. I hope you had a most fantastic birthday sweet Carole! Happy Belated Birthday! Sorry I missed it. Hope you got all you wanted and really enjoyed the day. Happy Belated Birthday Carole! Your husband wrote such a nice post. Have a great weekend. I’m looking forward to seeing some Moth on Monday. Happy Bithday Carole! Have a great weekend!